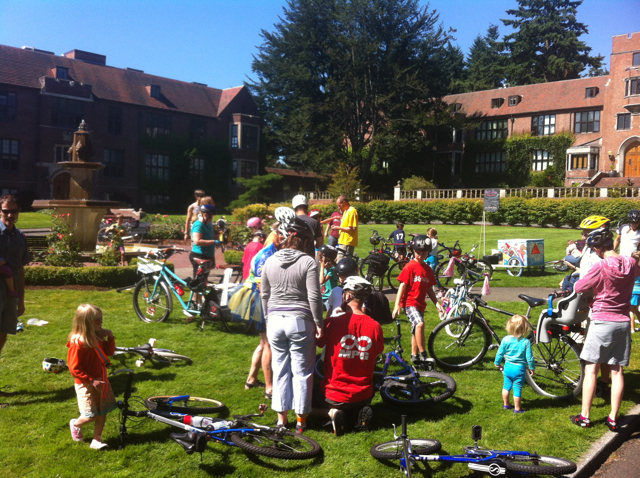 Kidical Mass #3 took place on Saturday July 13, starting and ending on the beautiful campus of the University of Puget Sound. We had 42 riders including Jeff's Ice Cream and several kitted members of the Tacoma Wheelmen's Bicycle Club who not only came along for the ride, but also offered mechanical support and TWBC tattoos! 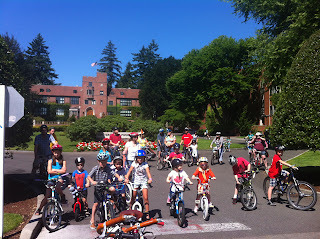 Once the kids were inked and their bikes were decorated, we had a brief safety message to emphasize Stay on the Right and Don't Bunch at Intersections. These have been key concepts to emphasize while we are on the road as well. 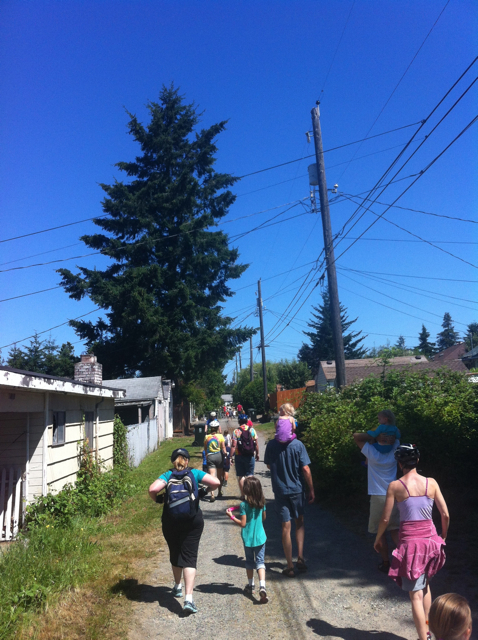 We made our way south to our first stop, the Central Tacoma Free Radical Media Exchange. 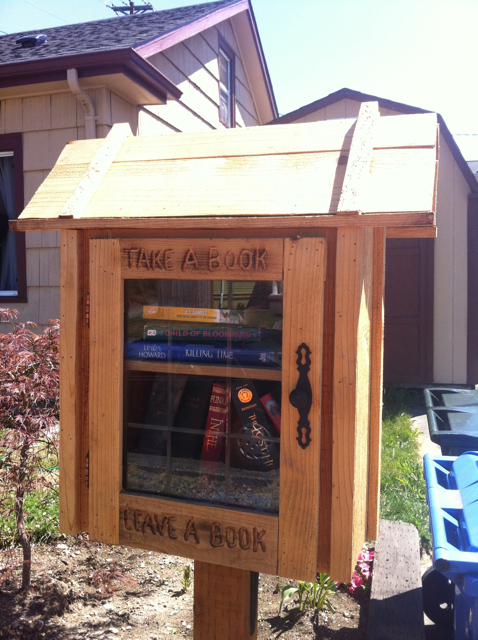 It's the largest of several Little Free Libraries in Tacoma. 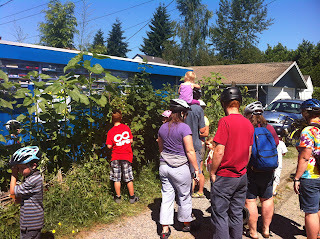 Because it's located down a loose gravel alley, we dismounted and walked down to check it out. The pocket library concept seemed new to most folks, but the kids quickly jumped right in to hunt for books and pick a few fresh raspberries. Many thanks to library curator RR Anderson for showcasing a great way to creatively re-use materials and share with neighbors. 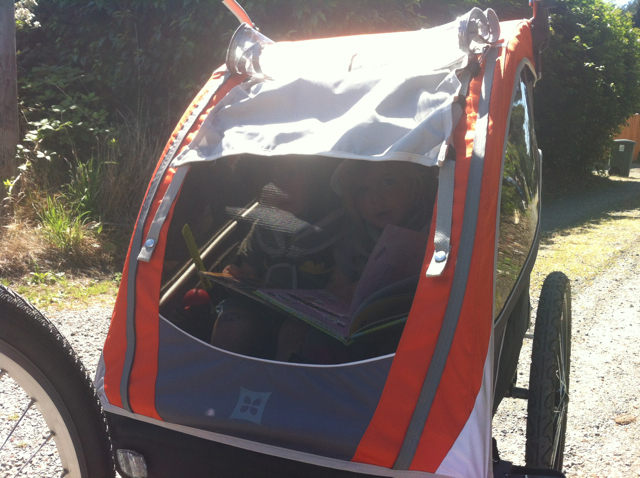 Now loaded up with books, we took off for Franklin Park. On the way we had our second minor crash that resulted in a flat 12" tire. A few folks stayed behind to try and patch the tube, while the rest of the bunch continued to the park for a longer break. Ultimately, the young rider's dad had to go back for his truck to give him a lift to the finish. There's always free ice cream at the finish and he had definitely earned his ice cream. Just a few blocks from UPS, a third rider went down. He was ok, buck shaken up. 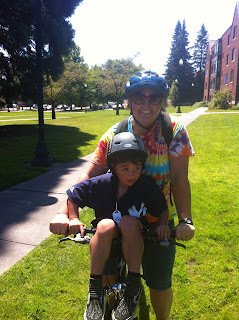 Thankfully, his mom was willing to give him a pump back to campus and a cargotrike dad was able to carry the young rider's 12" bike to the finish. Teamwork! Interestingly, when we pulled over to make sure mom and son were ok, several of the kids noticed we were stopped next to another little library! It was a surprise to me, too, since this one isn't registered on the LFL website. Look for it north of 6th on Puget Sound Ave.
Back on campus, the kids enjoyed made-in-Washington ice cream bars from Jeff's Ice Cream and raced bikes around Jones Fountain. 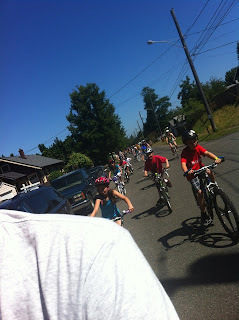 My helmet is off to all of the pedal parents and kid riders who persevered on this rather rough ride. The street surfaces of Central Tacoma are in the poorest condition of any that Kidical Mass Tacoma has ridden so far. 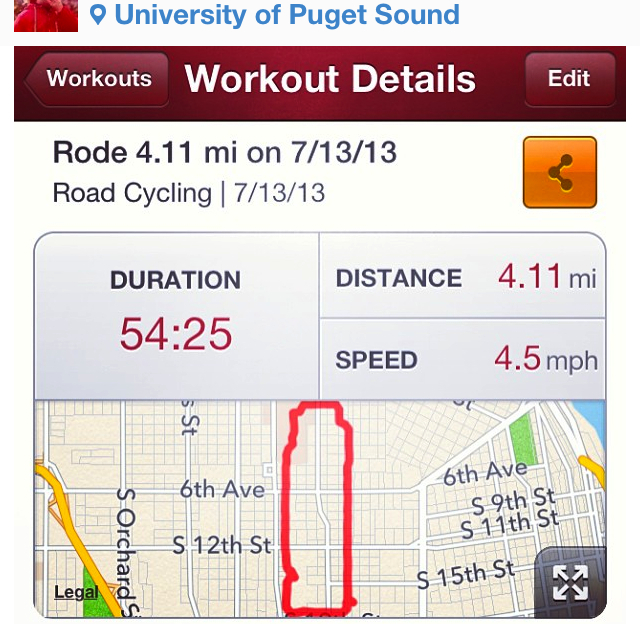 This was also our longest and most involved ride yet. Our average speed of 4.5mph has been quite consistent on our three rides and is based primarily on a single-speed rider with 16" wheels. 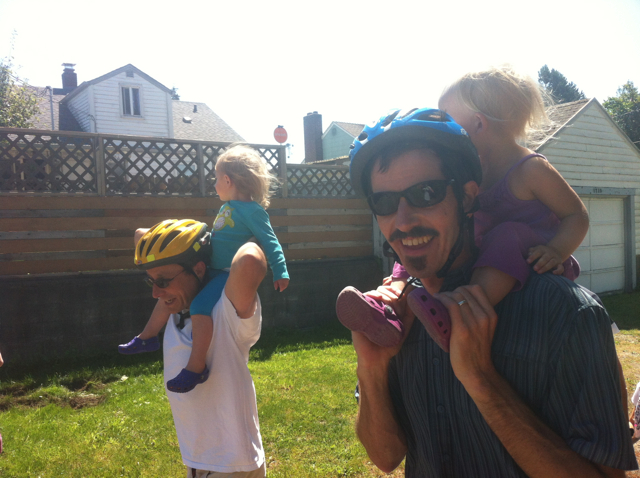 I don't want to discourage riders with 12" wheels from attending Kidical Mass, but parents should be aware that Tacoma's road conditions don't always play nicely with wheels that small. 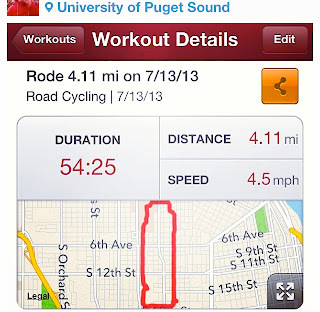 Potholes are the bullies of neighborhood family bike rides. As always, your feedback and comments on the ride are always appreciated. I'm still ironing out the route details for KM #4 in August, but it will likely be a South Tacoma route. More details to follow soon! 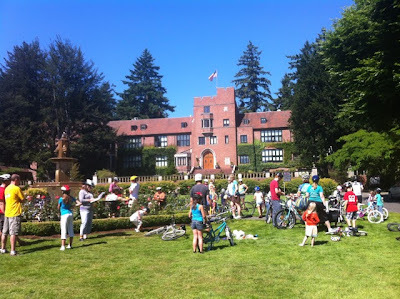 In partnership with City of Tacoma, Tacoma Art Museum is seeking local talented mixed media artists to participate in a bicycle helmet decorating contest. The bicycle helmets must remain functional while being dynamic and eye catching. The event will held at Tacoma Art Museum on August 17 from 11 am to 3 pm during the Best of the Northwest Summer Festival. 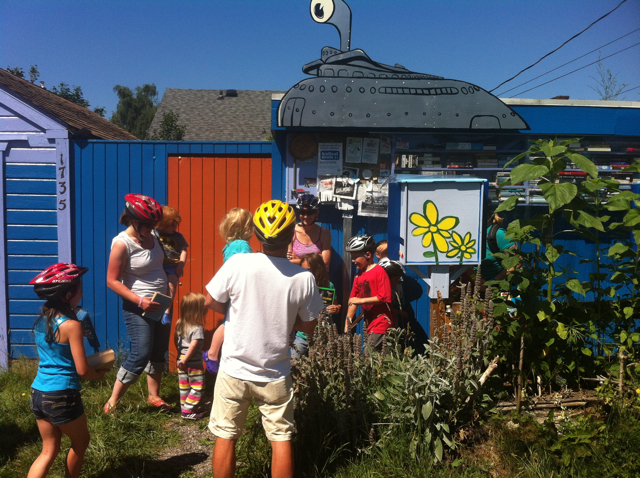 Participating artists will receive a bicycle helmet to decorate, an assortment of mixed media supplies, receive 20 dollars of credit at Tinkertopia, and an honorarium of 50 dollars for participating. During the event there will be a ballot box for people to vote for their favorite helmet. At 3 pm the first, second, and third place will be announced. After the festival the helmets will be on display at Tacoma Art Museum in the community art space until September 21. On September 22 during the Dome to Defiance Sunday Parkways bicycling event the helmets will be worn by special guests. Individuals and teams can participate though space is limited. 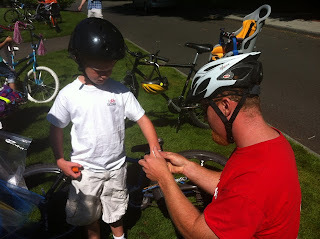 To participate e-mail jproehl@tacomaartmuseum.org with your team name, contact information, and helmet decoration concept. Participants will be selected based off of the creativity and feasibility of their ideas. Everyone is welcome to come watch the helmet decoration contest and vote during the Best of the Northwest Summer Festival on August 17. During the festival enjoy an array of art experiences in different media: create landscapes with watercolors, sketch a still life, or collaborate in an immersive, multi-media art project. Museum admission and activities free all day. If you have additional questions please e-mail jproehl@tacomaartmuseum.org. Thanks, RR! I'll tell our KM riders about the event and encourage them to check it out after the ride.